About us - Hoosier History Live! Hoosier History Live was developed by Nelson Price and Molly Head and is independently produced along with a consortium of Central Indiana journalists, historians, event planners, marketers, and web and audio artists/technicians. Many thanks to WICR 88.7 "The Diamond" for hosting Hoosier History Live and being Central Indiana’s station of choice for local public radio production and programming. Nelson Price is an Indianapolis-based author, journalist and historian. 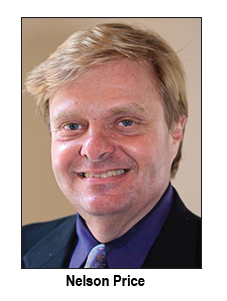 An award-winning former feature writer/columnist for The Indianapolis Star, he specializes in writing books about famous Hoosiers (both contemporary and historic figures) and Indianapolis city history. His books include Indiana Legends: Famous Hoosiers from Johnny Appleseed to David Letterman (Hawthorne Publishing, 2005 revised edition), which features profiles and vignettes about 160 notables, and The Quiet Hero: A Life of Ryan White (Indiana Historical Society Press, 2015), a biography of the Kokomo teenager with AIDS who drew international attention during the 1980s with his crusade to attend school. Nelson also is the author of Indianapolis Then and Now (Thunder Bay Press, 2004), a visual history of his hometown. A fifth-generation Hoosier, Nelson grew up in Indianapolis and is a Phi Beta Kappa graduate of Indiana University-Bloomington. He has taught journalism at IUPUI and currently serves on the boards of several civic, history and journalism-related organizations. They include the Indiana Journalism Hall of Fame and the Society of Indiana Pioneers. Drawing from his popular books, Nelson provides commentary on motorcoach tours across Indiana. He writes for several magazines and regularly speaks at schools across the state as part of PTA-sponsored presentations about Indiana history. He also is the author of Legendary Hoosiers (Guild Press of Indiana, 2001) and Indianapolis: Leading The Way (Towery Publications, 2000). Since the initial publication of Indiana Legends in 1997, it has had four editions and seven printings. Nelson has been named a Sagamore of the Wabash by two Indiana governors. At The Indianapolis Star and its sister newspaper, the bygone Indianapolis News, Nelson won more than 45 awards for his profiles of Hoosier newsmakers. The Indiana Historical Society has honored him with its Jacob P. Dunn Jr. Award. "The show is a blast!" Nelson says of Hoosier History Live. "By showcasing all aspects of our heritage in a captivating, yet informative, way, we’re proving that history can be dynamic." Nelson can be reached at nelson@hoosierhistorylive.org. To receive information about ordering Nelson Price's book book Indiana Legends, visit Hawthorne Publishing at www.hawthornepub.com. For his book The Quiet Hero: A Life of Ryan White, visit the Indiana Historical Society at indianahistory.org. Molly has been an independent radio producer in Central Indiana using talent other than herself since 2003. (She hosted the talk show Conversations on WICR from 1998 to 2003, with topics focusing on social issues.) 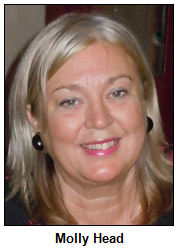 She created and produced the food, wine and gardening show Chefs' Rendezvous (2003 to 2005) with Becky Hostetter, Prosper Namias and Jo Ellen Meyers Sharp. Following Chefs, she created and produced another food show, Too Many Cooks! (2005 to 2008), with Patti Denton, Gary BraVard, Jo Ellen Meyers Sharp and Jill Ditmire. When she met Nelson Price at the WICR studio in 2006, she knew she had found the perfect host for the live call-in history show that she had always wanted to produce. She has been working on Hoosier History Live, along with Nelson Price, since 2006. Its initial airdate was January 12, 2008. Molly also has several decades of experience working in media, marketing and production, including work in marketing at WFYI (1997 to 2002) and in production at WICR (1998 to present). She has served as reporter and editor for AdScript, a monthly publication of the Ad Club of Indianapolis (1995-1997), and she also worked as a news intern at a commercial television station, WBRC-TV in Birmingham, Ala. (1976-77). Molly has worked in national customer support for McGraw-Hill in Houston, Texas (1984), supporting an online trading system for the petroleum industry, and in national customer service for Legislex Associates, an online legislative information service based in Columbus, Ind.(1978-82). Molly spent her high school years in Columbus and has a B.A. in urban studies from Antioch College. Although born in Illinois, she has pioneer Hoosier ancestors on her mother's side. Her great(x4)grandfather, Ansel Hyde, crossed the Ohio River into the Indiana Territory in 1808. Molly is also a member of Broad Ripple Kiwanis, Scottish Society of Indianapolis, Biblios book club, and Society of Indiana Pioneers. Molly says she's one of those persons who is both left brained and right brained, if one goes for such theories. She's a creative who also has a head for business. Michael Armbruster (aka "Mick") edits the Hoosier History Live website and email newsletter and is spearheading our efforts to promote the show as a podcast. Mick is originally from Santa Fe, New Mexico, but he took his undergraduate degree at the University of Virginia and also studied for a year at Moscow State University in Russia. He went on to do graduate work at both IU and IUPUI. He taught English at Arsenal Technical High School and Brebeuf Jesuit Preparatory School, both in Indianapolis, for 19 years before transitioning to his present career of "creative self-employment." Mick says he loves working with the Hoosier History Live crew and getting the opportunity to develop and use his language and computer skills in a real-world setting. Richard Sullivan consults on technical matters and gets us out of hot water when Mick breaks the website. 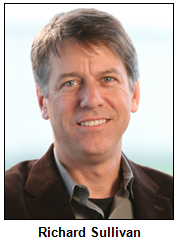 Richard was a reporter alongside Nelson Price in the 1980s and '90s at The Indianapolis News. Now he runs Monomedia, an Indianapolis-based website and photography company. Monomedia also does PC consulting. In fact, that's how Richard got hooked up with Hoosier History Live - Monomedia has been Nelson's IT department since Nelson stepped away from the newspaper business. A longtime downtown Indianapolis resident, Richard is former president of the Chatham Arch Neighborhood Association and has served on the board of the Chatham Arch Neighborhood Foundation. He earned a bachelor of arts degree in English and journalism from Marshall University in his hometown of Huntington, W.Va.
Pam Fraizer creates the original artwork for Hoosier History Live Media, including enewsletter, website and print. She specializes in custom drawing and illustration and says she was influenced by Warner Brothers cartoons and animation of the 1950s and '60s where drawings were used to evoke a feeling or a message. She enjoys turning a client's vision into art that communicates the organization's message and mission. She especially likes working on children's books, and her favorite long-term client is the Indiana Civil Liberties Union. 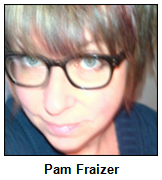 Pam founded her own design firm, Fraizer Designs, in 2004. She received a fine arts degree from Ball State University and for the past 20 years has worked with local and national non-profits.